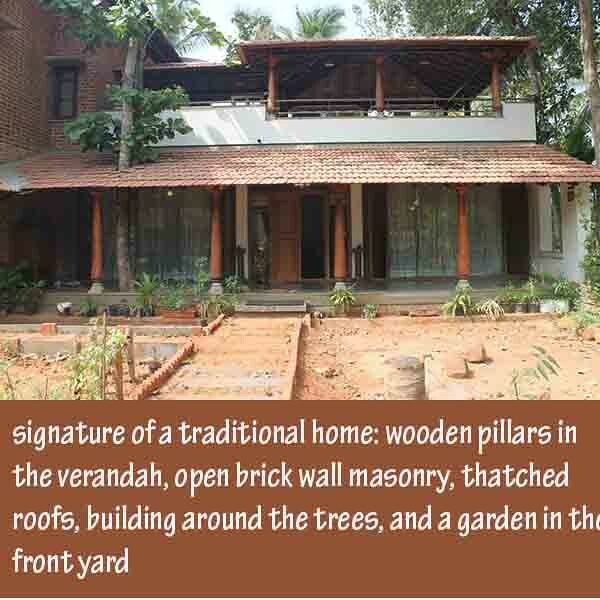 Planning to buying a old home and renovate it on a budget? Then this is for you. 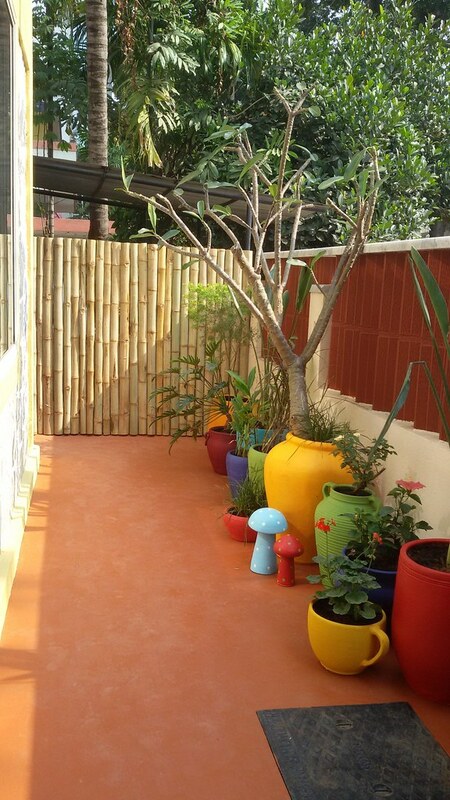 You will discover which interior designer to connect with, and garden, flooring and furnishing ideas. There’s something about taking a peek inside real homes. 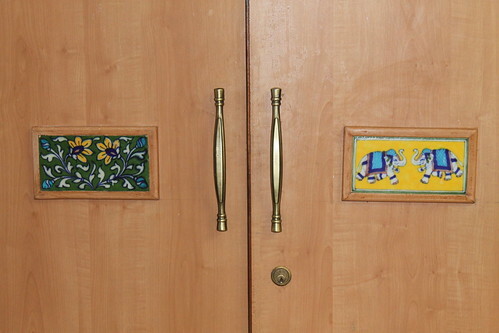 There’s a bit of suspense of what lies behind those doors, of how people dress their homes, and the excitement builds if the doorway is tastefully decorated. 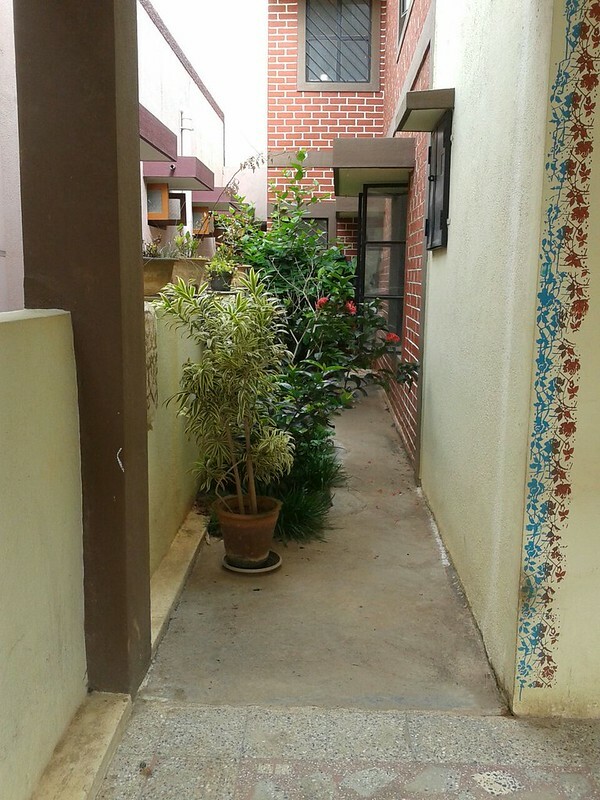 What I have for you today is the renovation of a 20-year old home in Vidyaranyapura, Bangalore by Jyothika Baleri of Destination Designs. Renovated homes are tricky and it takes trained eyes to see beyond what is obvious and unlock the potential. does the house need to be demolished completely? what architectural features can I retain? how much of the wood can be reclaimed and put to use? what are the weak points and star features of the home? is the current light flow sufficient, or the do the windows need to be made bigger? The compound wall was low and people could easily scale the wall or look in.So we raised the height aesthetically using porotherm blocks. 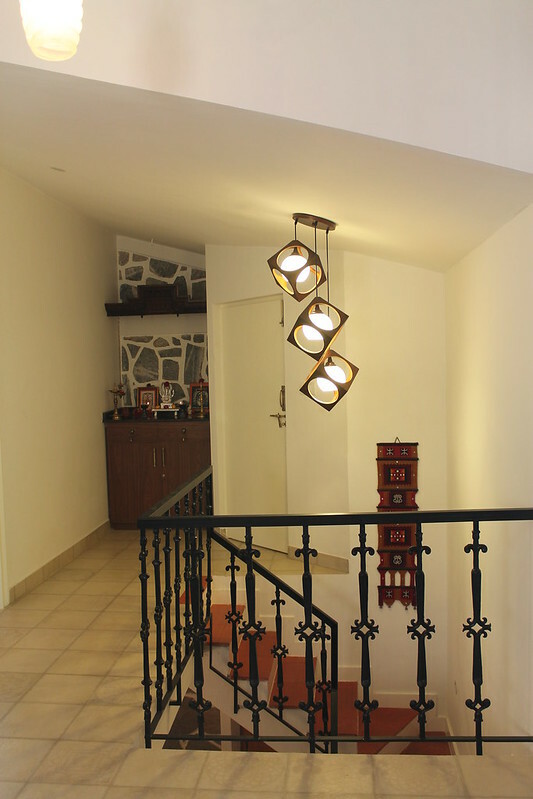 The living area had a simple metal seating and a concrete narrow staircase leading to first floor.The flooring of the entire home was mosaic. 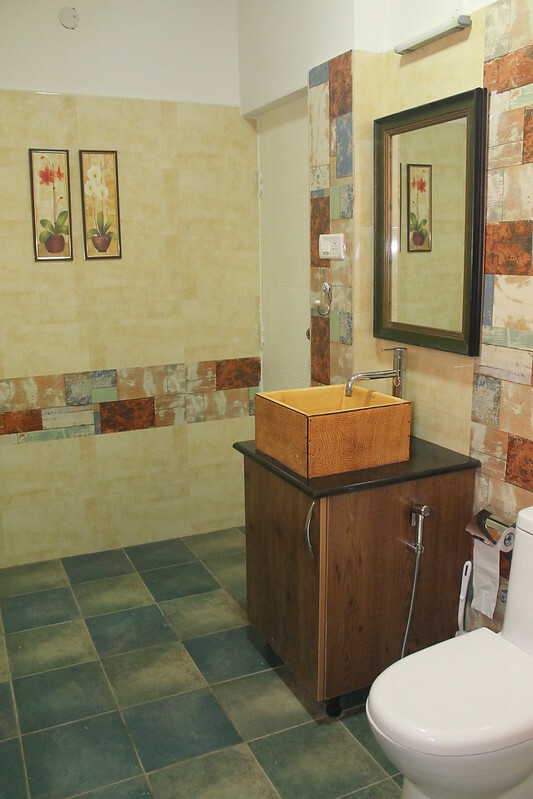 We changed it to a rustic terracotta colored vitrified tile to mimic natural terracotta tiles. 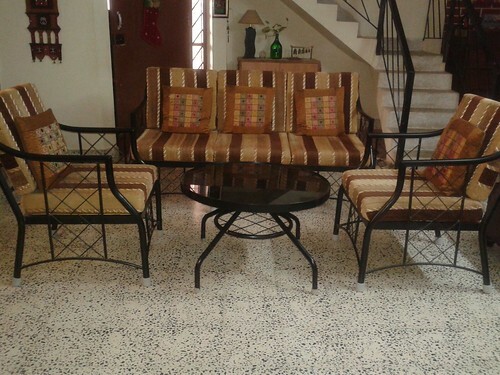 This was easy on maintenance and gave us the desired look we were trying to achieve without compromising the looks. 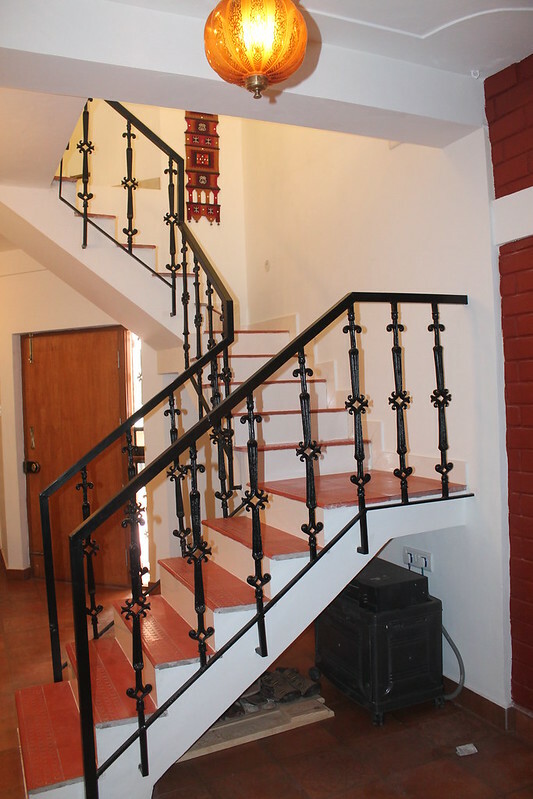 The narrow staircase was partly widened and railings changed to wrought iron balustrade. 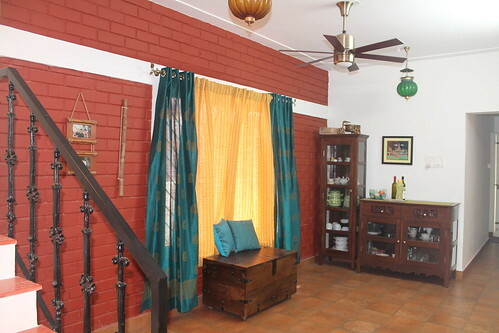 Dining area: The dining area is decorated with an antique overhauled hutch and crockery unit. 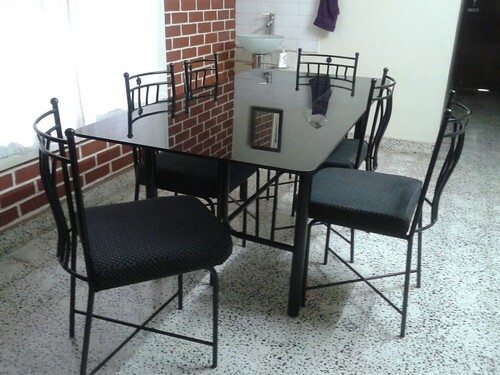 The dining table and chairs are in a distressed finish. 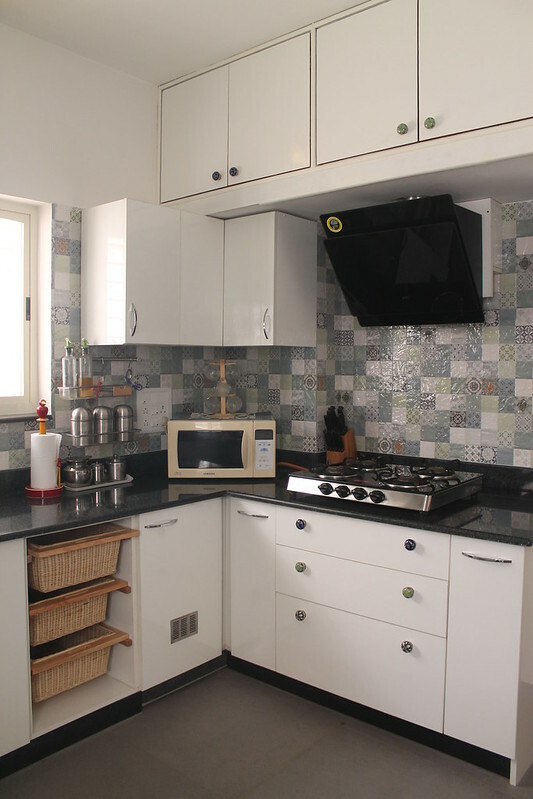 Kitchen was kept white so that the coloured ceramic knobs stood out with colour coordinated wall tiles. 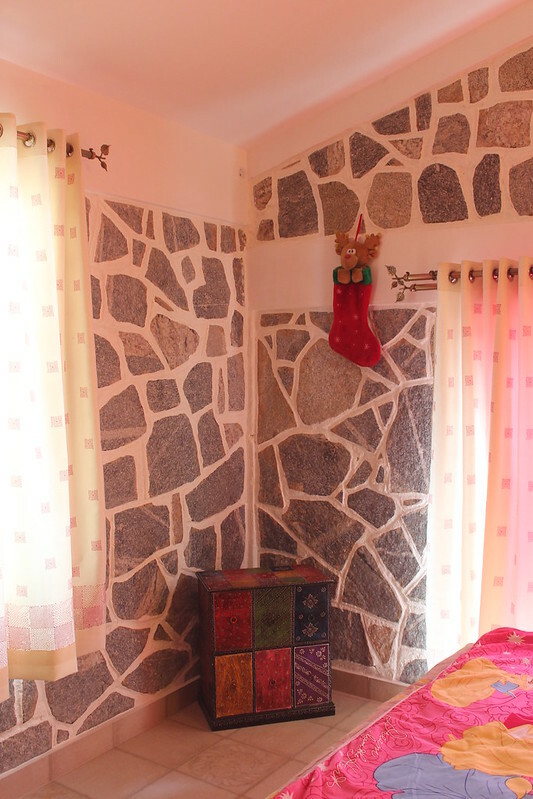 Pooja Unit was accommodated in an unused niche in the home. 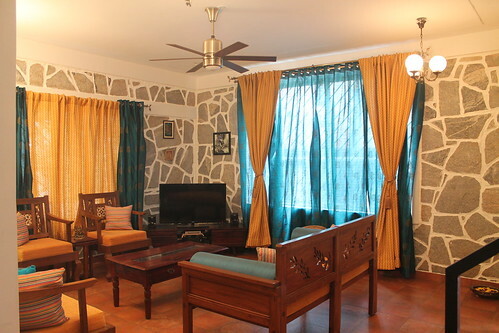 A simple base unit with an antique traditional “Mandangi” carved top frame to adorn the top of the unit. Guest bedroom in the ground floor is kept simple with an antique chest of draws and tile inlays on wardrobe to face lift the old laminated cupboard. Master bed room has a simple fretwork theme which is seen on all the pieces of furniture in this space. 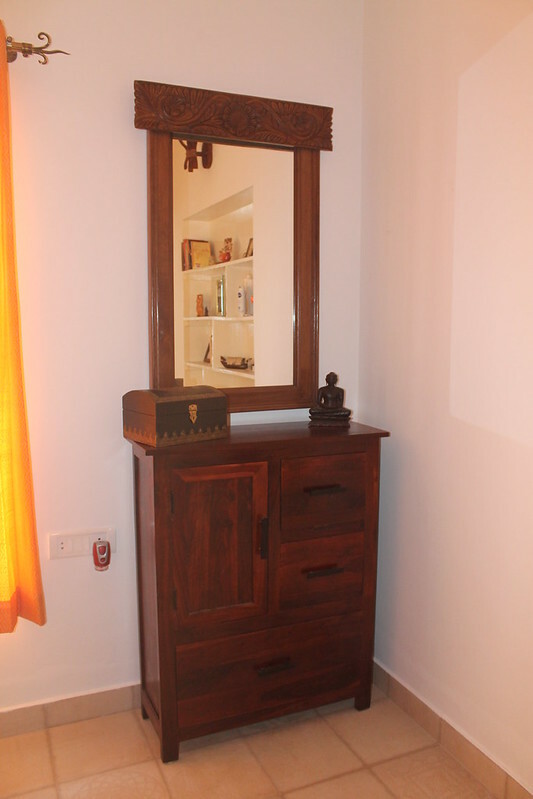 The mirror and wardrobe has carved panels for added aesthetic value to otherwise old furniture. 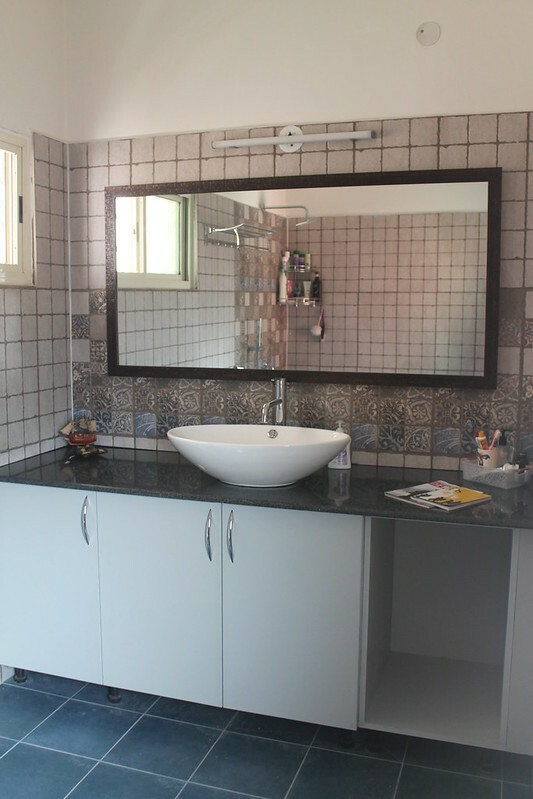 Master bathroom has a beach theme with blue and grey tiles and matching highlight tiles. Daughters room was not the typical pink room.But we brought pink in the curtains and furniture accents. The jaipur side table and toy chest were a perfect fit to add colour. 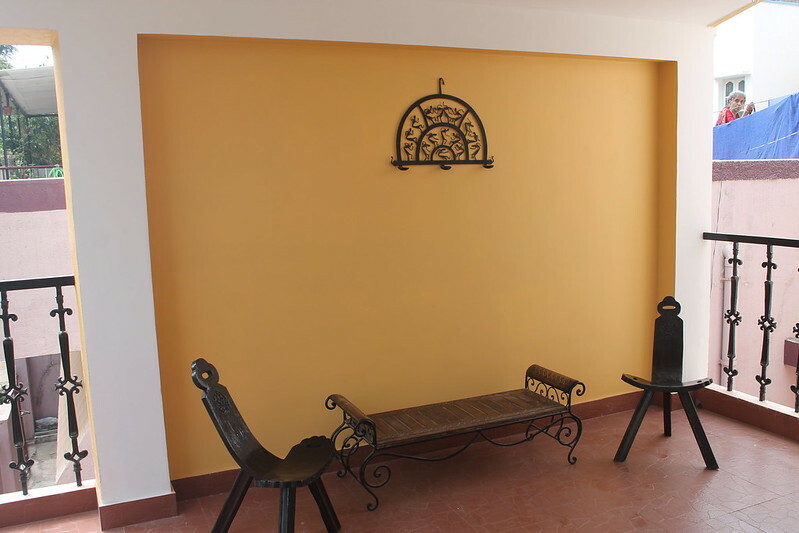 Porch/sit out has been painted a bright mustard to contrast the terracotta floor. Rajasthani sheesham outdoor furniture has been used here with a wrought iron mural on the wall.This matches the cast iron railings of the sit out. Hope you enjoyed this home tour. If you liked this home, then I believe you will like this traditional home filled with antique treasures, too. Here’s a teaser image for you. 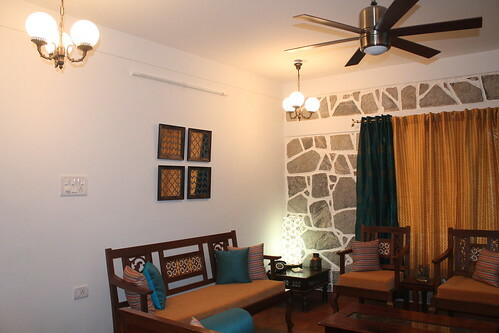 You may also want to check out a compilation of pooja room designs executed by her across projects. 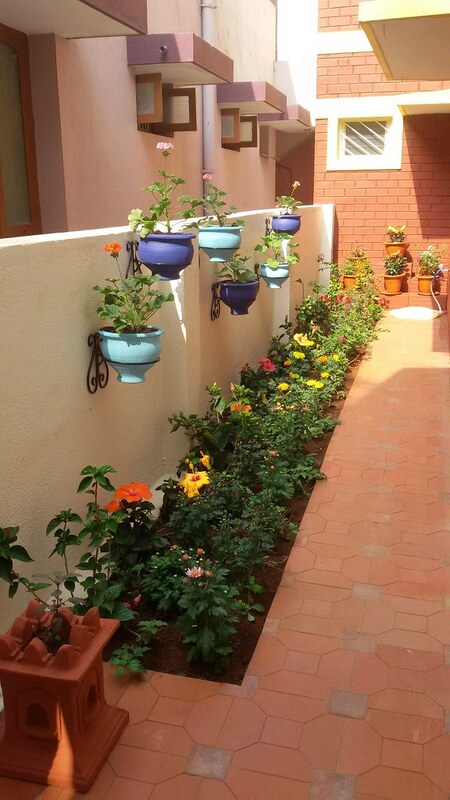 I love the way you re-decorated the entrance garden…it became pretty. Thank you for sharing. It was so inspired.. Awesome post. Especially I like the pictures of that flower garden. It looks pretty. Economical remodelling but also diy ideas. Thanks for sharing.